(a) Install a new bearing bracket hole snap ring to the front drive shaft assembly RH. 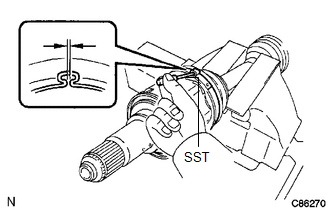 (a) Using SST, install a new front drive shaft bearing. The bearing should be completely installed. (b) Using a snap ring expander, install a new drive shaft hole snap ring. 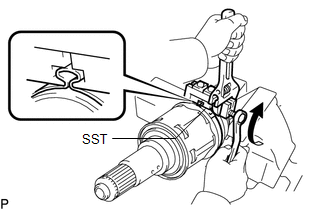 (a) Using SST and a press, install a new front drive shaft dust cover. The dust cover should be completely installed. 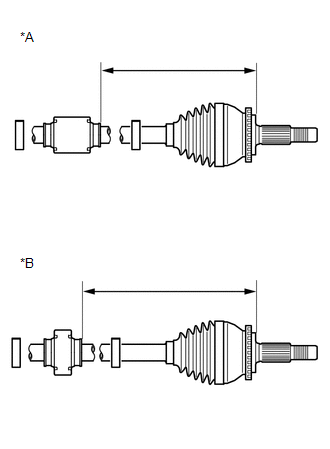 (a) Using SST and a press, install a new front drive shaft dust cover RH until the distance (A) from the tip of the center drive shaft to the front drive shaft dust cover RH meets the specification. 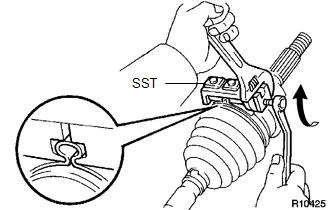 (a) Using SST and a press, install a new front drive shaft dust cover LH. 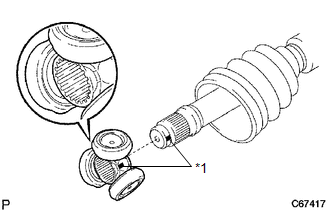 (c) Pack the front drive outboard joint shaft assembly and front axle outboard joint boot with grease from the boot kit. (a) Hold the drive shaft lightly in a vise between aluminum plates. (b) Install the front axle outboard joint boot clamp onto the front axle outboard joint boot. 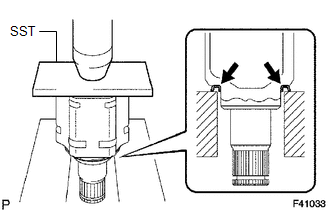 (c) Place SST onto the front axle outboard joint boot clamp. 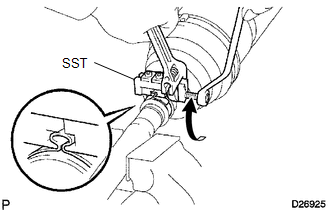 (d) Tighten SST so that the front axle outboard joint boot clamp is pinched. 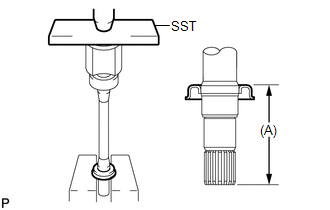 (e) Using SST, measure the clearance of the front axle outboard joint boot clamp. If the measured value is greater than the specified value, retighten the clamp. (a) Install the No. 2 front axle outboard joint boot clamp onto the front axle outboard joint boot. (b) Place SST onto the No. 2 front axle outboard joint boot clamp. (c) Tighten SST so that the No. 2 front axle outboard joint boot clamp is pinched. (d) Using SST, measure the clearance of the No. 2 front axle outboard joint boot clamp. 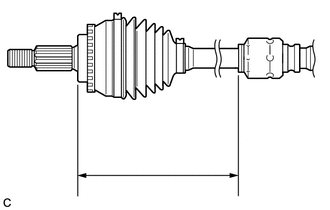 (a) Install the front drive shaft damper to the drive shaft. 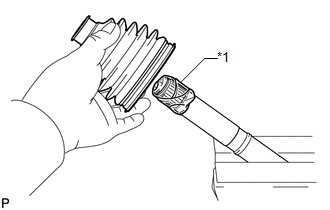 Make sure that the damper is on the shaft groove. (b) Set the distance as specified below. 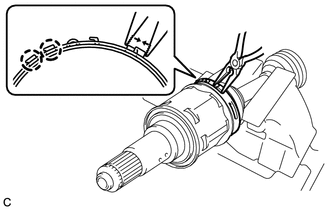 (c) Install a new front drive shaft damper clamp onto the front drive shaft damper. 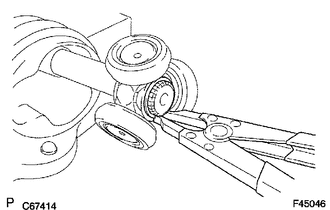 (d) Place SST onto the front drive shaft damper clamp. 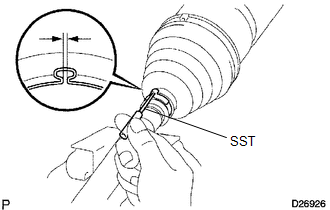 (e) Tighten SST so that the clamp is pinched. 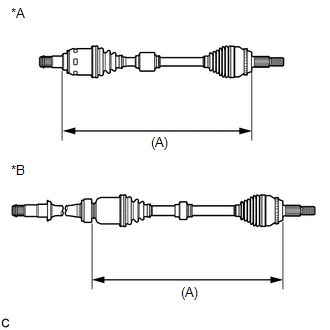 (f) Using SST, measure the clearance of the front drive shaft damper clamp. 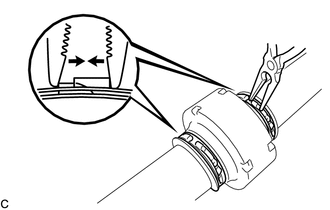 (a) Temporarily install the front drive shaft damper and 2 new front drive shaft damper clamps as shown in the illustration. 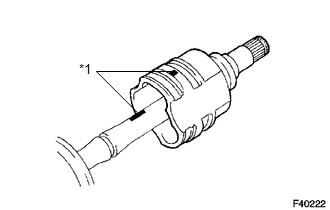 (b) Using needle-nose pliers, install the 2 front drive shaft damper clamps as shown in the illustration. 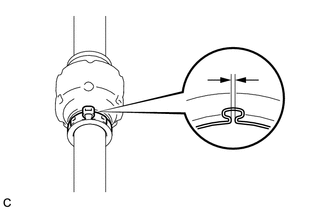 (c) Place the beveled side of the tripod joint axial spline toward the front drive outboard joint shaft assembly. (d) Align the matchmarks placed before removal. (e) Using a brass bar and a hammer, tap in the tripod joint to the front drive outboard joint shaft assembly. (f) Using a snap ring expander, install a new shaft snap ring. (g) Pack the front drive inboard joint assembly and front axle inboard boot with grease. (h) Align the matchmarks and install the front drive inboard joint assembly to the front drive outboard joint shaft assembly. (a) Install the front axle inboard joint boot to the front drive inboard joint assembly. (b) Secure the front axle inboard joint boot clamp onto the front axle inboard joint boot. 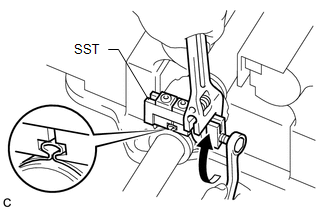 (c) Place SST onto the front axle inboard joint boot clamp. 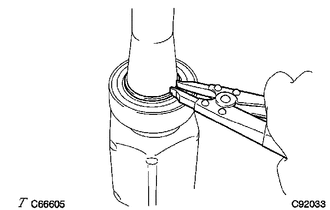 (d) Tighten SST so that the front axle inboard joint boot clamp is pinched. 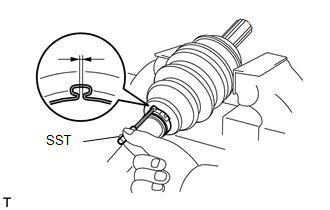 (e) Using SST, measure the clearance of the front axle inboard joint boot clamp. 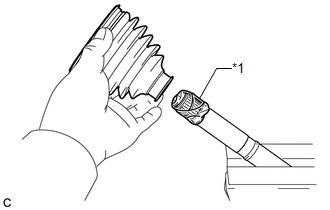 (a) Using needle-nose pliers, engage the 2 claws to install the No. 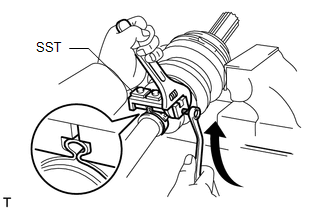 2 front axle inboard joint boot clamp as shown in the illustration. 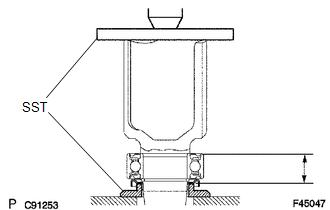 (a) Hold the front drive inboard joint shaft assembly in a vise between aluminum plates. (b) Secure the No. 2 front axle inboard joint boot clamp onto the front axle inboard joint boot. (c) Place SST onto the No. 2 front axle inboard joint boot clamp. 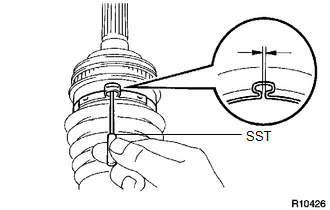 (d) Tighten SST so that the No. 2 front axle inboard joint boot clamp is pinched. 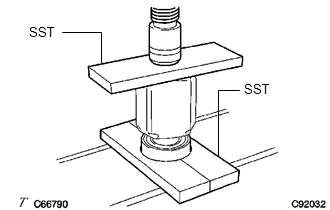 (e) Using SST, measure the clearance of the No. 2 front axle inboard joint boot clamp. (a) Install a new front drive shaft hole snap ring.